Go from village to village, do good to humanity and to the world at large. This was the clarion call given by Swami Vivekananda more than a century ago to the youth of India. Swamiji’s message went beyond geographical boundaries to include the whole of humanity. The founding of the Swami Vivekananda Youth Movement was a response to this call, and over the last 26 years, we have been engaged in multiple service delivery projects across the state of Karnataka. While there is no dispute that such projects are essential and are of enormous significance to the millions of people who have given us an opportunity to serve them, one also needs to look at the message of Swamiji from an expanded perspective. Somewhere along the way, charity and service provision can create dependency and diminish human entrepreneurship. We need to constantly watch our responses to make sure that we are not, in any way, dis-empowering the people whom we are working with. The man-making message of Swami Vivekananda resonates with the need to empower and build people to take care of themselves and move away from handouts and doles to becoming self-reliant and self-sufficient. This calls for a re-interpretation of all that we do, and out of this thought was born the Grassroots Research And Advocacy Movement (GRAAM). GRAAM was formally launched on 12-Jan-2011, the jayanthi (birthday) of Swami Vivekananda. GRAAM is founded on the belief that there are several dimensions impacting development. Moreover, one dimension of development gives birth to newer ones. We at GRAAM believe that development is the constant expansion of human capabilities. This definition of development, though abstract in nature, actually manifests itself tangibly – often as securities and liberties for communities and individuals. These could be social, political, religious, economic, linguistic, food-related, gender-related, agricultural, religious, and much more. Manifestations of these tangible securities and liberties are indicators of a developed community/state/nation. For instance, a tribal from a forest area should have the political space to contest in an electoral process. Everyone must have the freedom to practice or to not practice a particular religion. A woman must be free from any constraints that gender may impose on her. An expansion of capabilities is GRAAM’s concept of development. In the constitutional context of India, the State and Community are the only permanent institutions. They share an intricate relationship and heavily depend on each other. The state makes laws for the citizenry and the citizenry populate the structures made by the state. The state promises all services and securities to its citizenry. However, it is often unsuccessful in delivering the services it promises to its intended beneficiaries. NGOs then step in to do the state’s job. Realizing that the NGOs are doing their job more effectively, the state extends support to these NGOs. The post-1991 deregulation of economy freed the private sector and made it a major player. The private sector (also owned and populated by the communities) contributes to the state by paying taxes, which then can provide welfare to the communities. By paying salaries to the community members, the private sector contributes to the expansion of capabilities. 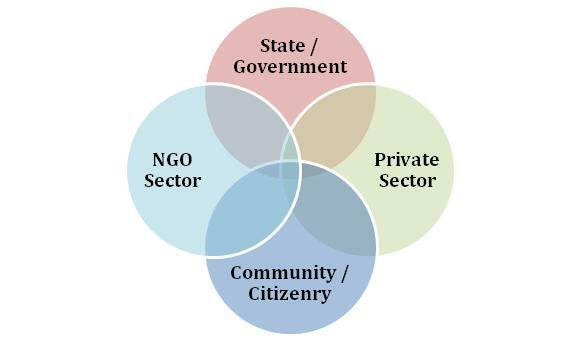 Thus, the four players (community, state, NGO sector and private sector) constantly engage and interact with each other. Though there are several factors affecting development, GRAAM focuses its approach on the four primary players and their interactions. It aims to facilitate these interactions to impact the development of India, setting a model for the progress of other developing nations. GRAAM is an opportunity to secure legitimate space for communities to determine what their own development is. The word graam in many Indian languages, means a ‘village’. GRAAM is an institute that allows direct grassroots level intervention in measuring and shaping societal change. It aims to pursue sustainable development through collaborated efforts from developmental agencies, governmental organizations and the public, making development a ‘community movement’. Research is traditionally top-down driven, where most researchers are often an elite group of people sitting in a think tank, often without adequate exposure to realities of the developing world. The enormous amount of development-research results in publications, papers or press conferences, but often does not go beyond that. GRAAM aims to change this paradigm. It aims to study the impacts of any intervention on communities. GRAAM aims to conduct research from a bottom-up perspective. The research questions emanate from the grassroot level and get translated into academic language through GRAAM. The outcome of this research is then taken back to the political or bureaucratic system as ‘policy interventions’ to advocate for change. GRAAM will leverage the relationships of SVYM in local populations, governmental and development agencies in India and in academia. Discussions are underway with several academic institutions in India and abroad to formulate the organizational structure and the work-flow needed for its successful functioning. An independent board, that will ensure unbiased, pertinent and needed activities, will direct GRAAM. For more info, please visit GRAAM’s website.